We need more not less truly affordable social rented homes, but this trend is the direct result of government policy. 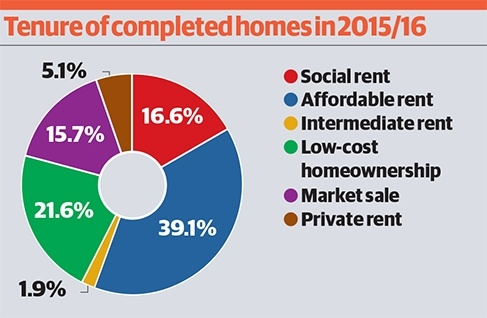 Not only are less homes being built but too few of them are social rented homes. Last year, 2,989 (or 8%) of homes completed by the top fifty were for sale on the open market. But in 2015/16, this rose to 5,029 (or 15%). Associations such as Genesis (which plans to merge with Thames Valley Housing Association) have signalled their intention to move out of social rented housing. The boss of Genesis housing, Neil Hadden complains that Moody’s have downgraded Genesis to ‘Baa1’ because they say “increased commercial exposure leads to increased reliance on the housing market remaining buoyant”; Moody’s predict that sales will account for 54% of Genesis’ turnover by 2020. He says Moody’s don’t understand the new business model but the problem seems to be precisely that they do understand its risks. At the same time as associations claim their critics simply don’t understand their business model many use the “difficult business environment” to justify cuts backs to services, staffing levels and perms and conditions. As they become increasingly financialised and commercial they make tenants and their workers pay. Of course it’s all so stressful that finance directors and chief executives need inflation busting pay increases! The key undelying factor in the lack of truly affordable houisng is deep cuts in grant. This year the governemnt imposed 1% rent cut is a factor. Associations point to the lack of skilled labour in contruction surely showing the need for better apprentiships and more direct labour with proper employment conditions. The housing crisis continues to deepen with high private rents and out of reach, house prices. Rough sleeping rockets and official local authority homeless acceptances are up over 50% since 2010. Government policy continues to make all this worse. The current ‘coup’ attempt in the Labour party is relevant. In his election campaign Jeremy Corbyn called for rent control and explained that there is no solution to the housing crisis without a massive expansion of council house building – which depends on an end to austerity. This was an important factor in the huge wave of support generated by Jeremy Corbyn – in particular amongst housing workers. We should recall that before Jeremy Corbyn was elected Labour had dropped its commitment to a very limited form of rent control, abstained on welfare cuts and was committed to ‘austerity light’ at best. The stand that Unite has taken in support of Jeremy is directly in the interest of housing workers and anyone who wants and end to the houisng crisis.